is not only among a select group of “Planes that changed the World” it is still in active service in all corners of the Globe to this day. Even now, the old adage that “The only replacement for a DC-3, is another DC-3” still holds true and there is no other aircraft available today at an even remotely afordable price that can do what a DC-3 can. After retiring from commercial and military (C-47) service, many of these aircraft became the forerunners of today’s modern corporate jets. 1939 at a cost of $105,611.29. This was one of two aircraft requisitioned by Major General Henry ‘Hap’ Arnold along with a sister ship (designated as a C-41, and also still flying today as N41HQ) as VIP transports for himself and military command staff , as well as other high ranking officials including the Secretary of War. These aircraft were based at Bolling Army Airfield, Washington D.C. as a part of the 1st Staff Squadron. The aircraft was well appointed and the main cabin was equipped with swivel seating to allow for inflight meetings. The forward cabin was originally configured with four sleeping berths and upper skylights, similar to those found on the original DST (Douglas Sleeper Transport). N341A today retains its original distinctive tail insignia and bare metal finish, albeit now highly polished and with the addition of dark blue highlighting along the fuselage window line. N341A is one of the lowest time DC-3’s currently flying with less than 10,000 hrs total time. There are examples still flying today with well over 90,000 hrs on the airframe! The current 14 passenger interior configuration was first installed in 1953 for corporate use by Superior Oil Company. N341A recently underwent a full stem to stern inspection, overhaul, and upgrade program with the emphasis on safety and operational reliability, making it probably the highest specification DC-3 in the skies. It is fully IMC (instrument meteorological conditions) flight capable with the installation of twin Garmin GTN750 GPS/Nav/Comm touch screen multifunctional display systems giving the flight crew live weather, traffic and terrain information and is fully ADS=B compliant. In addition there are freshly rebuilt P&W 1830-94 engines and the aircraft is equipped with wing and propeller de-ice boots and a low pressure auxiliary oxygen system. 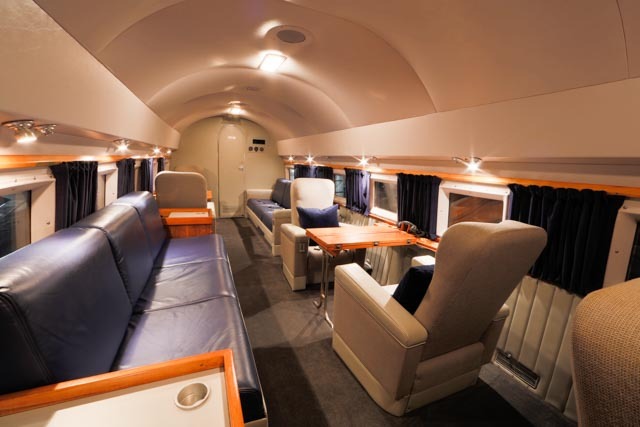 All of this work has been undertaken to the highest industry standards by renowned DC-3 expert Paul Bazeley and his experienced crew at Aerometal International in Aurora, Oregon. “DRY LEASE” operations for private use subject to qualified and insurance approved flight crew. Pre-approved and experienced independent flights crews are available for independent hire. Private Scenic Tours Point A to A only within a 25-mile radius. Film and Advertising Static and/or in Flight. Weddings, Anniversaries, Funeral and Memorial Flyovers. Fundraising and promotional/educational events for registered charitable organizations and non-pro ts with net proceeds benefitting charity.